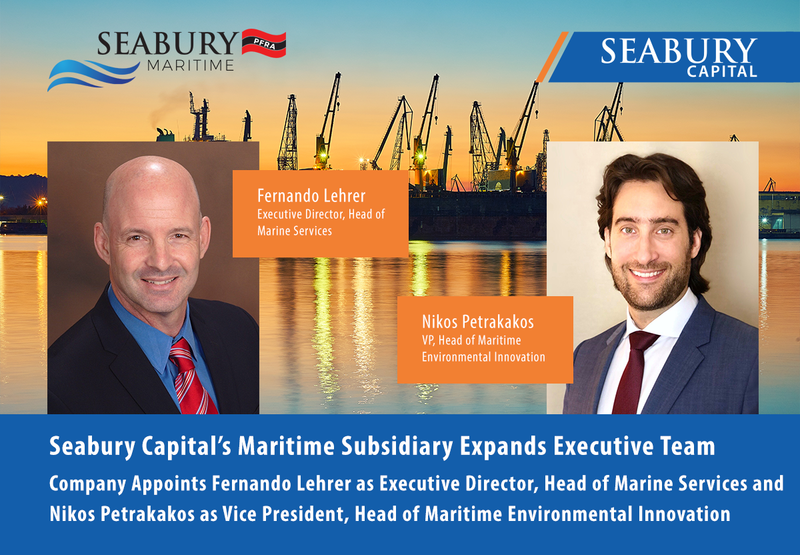 NEW YORK – October 25, 2018 – Seabury Maritime PFRA (“SMPFRA”), the global maritime and transportation investment bank and industry advisory, and a division of Seabury Capital Group LLC (“Seabury Capital”), announced today the appointment of Fernando Lehrer as Executive Director, Head of Marine Services, and Nikos Petrakakos as Vice President, Head of Maritime Environmental Innovation. Lehrer and Petrakakos are joining the SMPFRA’s leadership to further advance the company’s strategy to provide an integrated platform to its clients that delivers an end-to-end solution for their maritime-oriented transportation investment banking and consultancy needs. “Fernando and Nikos are thought leaders and visionaries in applying innovative solutions and technology to the maritime industry, and they will add valuable perspectives to our team,” said Seabury Maritime PFRA President & Chief Executive Officer Edward M.A. Zimny. Lehrer, who is based in Houston, Texas, will head the new Marine Services Unit, overseeing initiatives in maritime digitization, maritime technology, and advisory services. He will report to President & Chief Executive Officer Edward M.A. Zimny. Nikos, who is based in Edison, New Jersey, will head the new Environmental Initiatives Unit, which encompasses Green Ports, Environmental Advisory, and in conjunction with the SMPFRA Investment Banking Unit, Green Marine Equipment Finance (Scrubbers, Ballast Water, and more). He will report to Managing Director & Global Head of Advisory Patrick Bird. Prior to joining the company, Lehrer was Managing Partner at The Maren Group, a Houston-based advisory services firm focused on the maritime and offshore sectors, which also represents BASS software solutions. Previously, he served as President of London Offshore Consultants (“LOC USA”), one of the leading global independent marine and engineering consultancy organizations worldwide. He also held executive level positions at Lloyds Register (“LR”), where as Vice President of Ship Management Global Solutions, he was instrumental in creating LR’s original maritime digitization strategy; and at ABS, serving as Vice President of Nautical Systems, where he created innovative software solutions for ship operations, and also served in the roles of Director of Marine & Offshore Life Cycle Services and Head of the ABS Marine Casualty Response Center. Prior to LR and ABS, Lehrer worked as principal surveyor for a leading Hull & Machinery underwriter. He started his career as Project Manager for ship repairs and retrofits. He also is an entrepreneur who has spearheaded numerous maritime software platforms in the fields of e-commerce, maritime procurement, and asset management. Lehrer holds a MSc degree in Naval Architecture and Marine Engineering from the University of Buenos Aires, Argentina. Prior to joining the company, Petrakakos co-founded and served as Chief Executive Officer of Ursus Maritime Capital, a specialized consultancy, which was the first company in the maritime industry to provide turn-key ESCO-style project finance for fuel efficiency retrofits, scrubber & ballast water treatment retrofits, and alternative fuels for the maritime industry, as well as other sustainability and technology projects. Petrakakos has a broad experience in the maritime industry, both in the commercial and technical aspects, and is able to effectively bring solutions that address every stakeholder’s pain points. He began his career as Operations & Projects Manager at Oldendorff Carriers, the largest global dry-bulk ship operators, focusing on their Bauxite Transshipment project. He later worked for PPG Industries and Chugoku Marine in business development for coating technologies. He also worked for shipowner and operator HART Shipping (before Ursus was formed) as Commercial Director and served as a board member. Petrakakos holds a MSc degree from M.I.T. in Ocean Systems Management, and received his BSc in Naval Architecture & Marine Engineering from the Webb Institute.